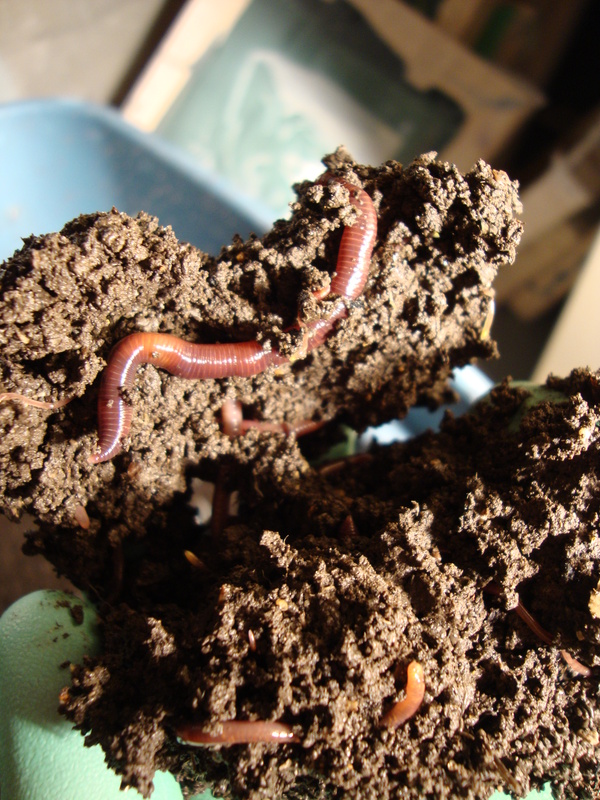 A few months ago we started a vermicompost bin in the basement with just a few worms and it has since exploded into and thriving population of thousands. 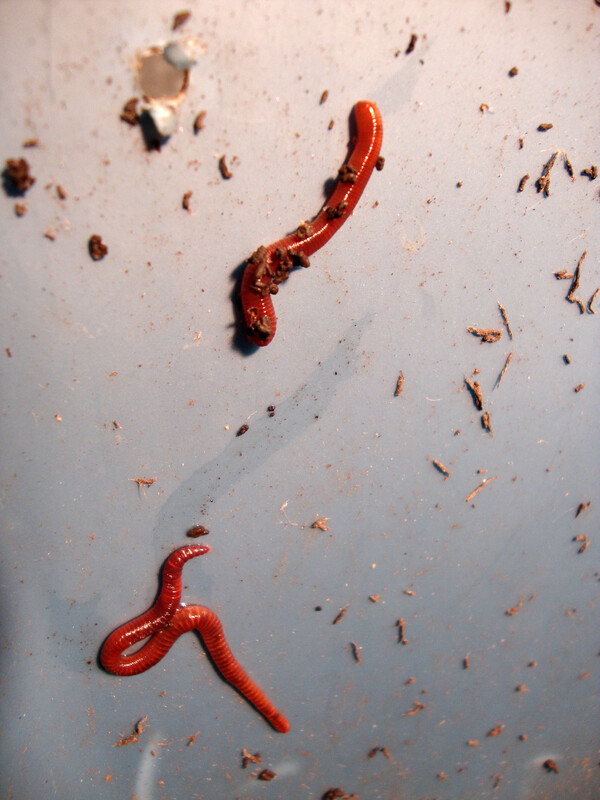 they are a mix of mostly red wigglers but also some night crawlers and other species from the garden soil outside. the worms have been providing us with rich casting tea which has become a big part of our indoor garden. when we first started experimenting with the habitat for our worms, we found that we were feeding them too often which created excessive amounts of moisture (making our worms unhappy as they tried to escape). we added some drainage holes to the bottom of the bin, which helped release some liquid, and began burying small amounts of food at a time under the top layer of soil. 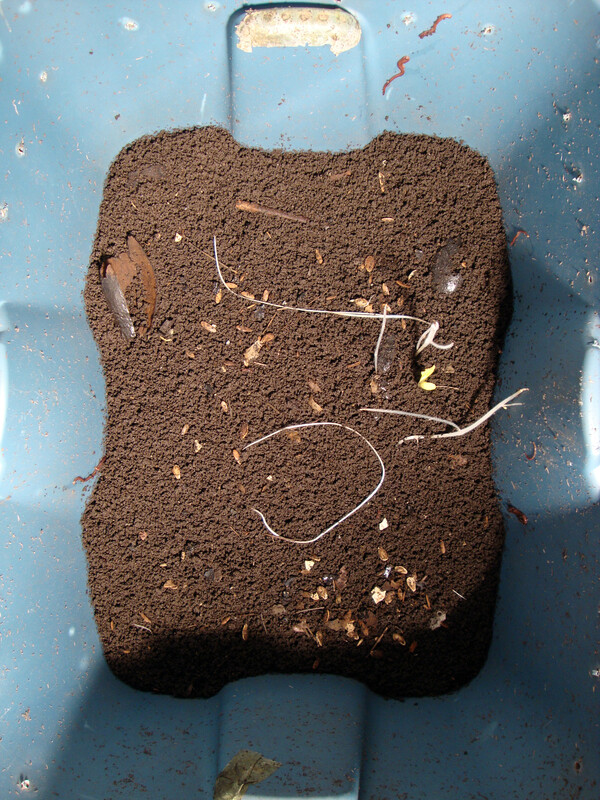 a week later we checked on the worms and they had all burrowed beneath the surface, leaving us a hearty, thick layer of castings on the surface. It may shock some that we have worms living in the basement feeding off decomposing food scraps, but there is virtually no smell as breakdown and consumption happens quickly due to the vast number of worms, bacteria and other organisms living in darkness- it is a 24 hour feeding frenzy. plus it’s also an efficient, earth-friendly way during the winter to convert fruit and veggie leftovers into fertile, nutrient-dense black earth. 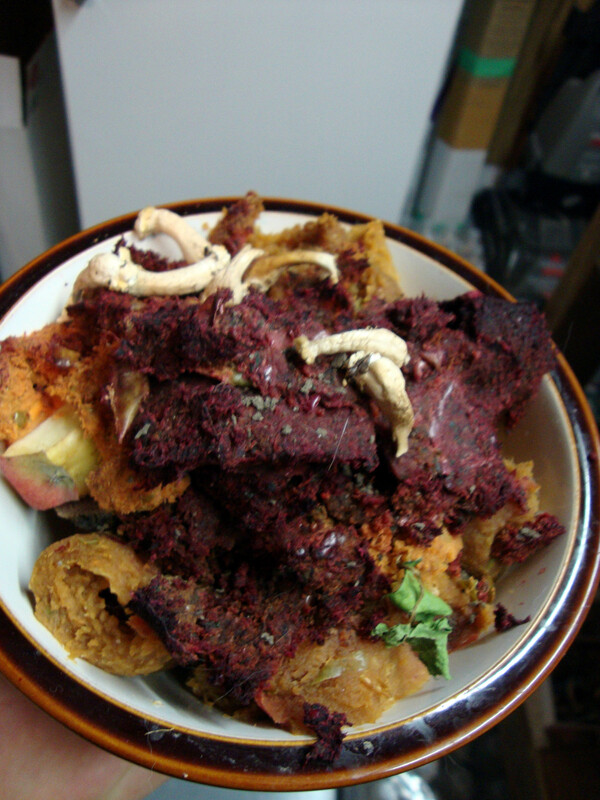 Today we fed them all the rainbow pulp left over from juicing, they don’t much like acidic foods so we try to give them a variety of easily digestible fruits and greens (grated or chopped into small bits). 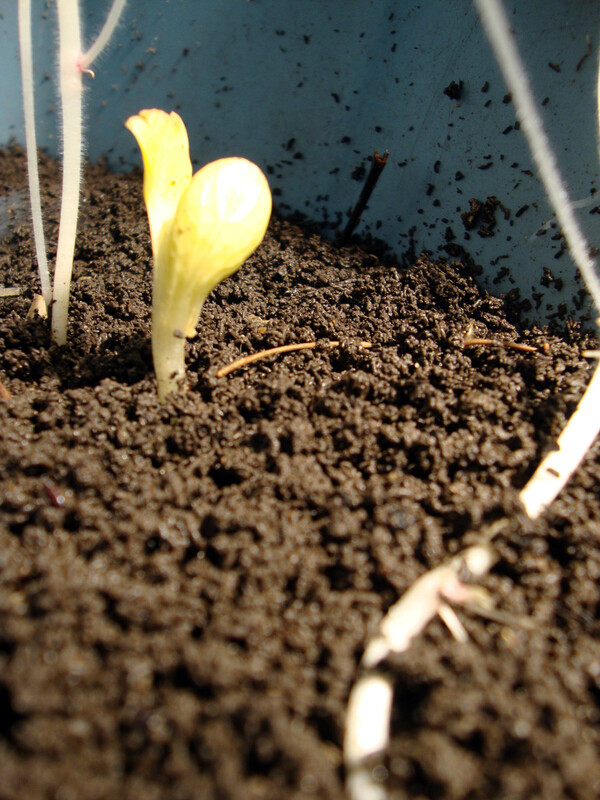 Sometimes willful melons and potatoes sneak in and begin sprouting in complete darkness! 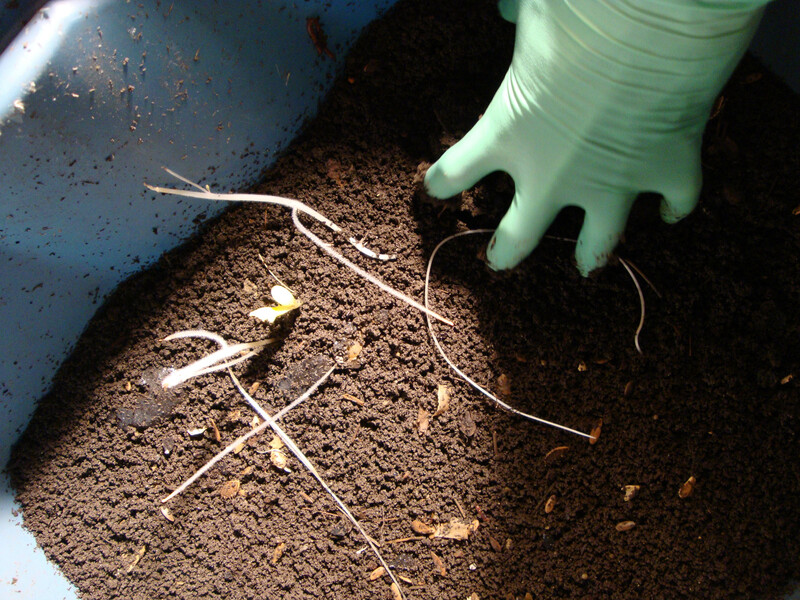 We often find mycelium and small mushrooms sharing the space, helping the break down but also germination- like the avacado pit in the pictures below (a little gift from the worms). 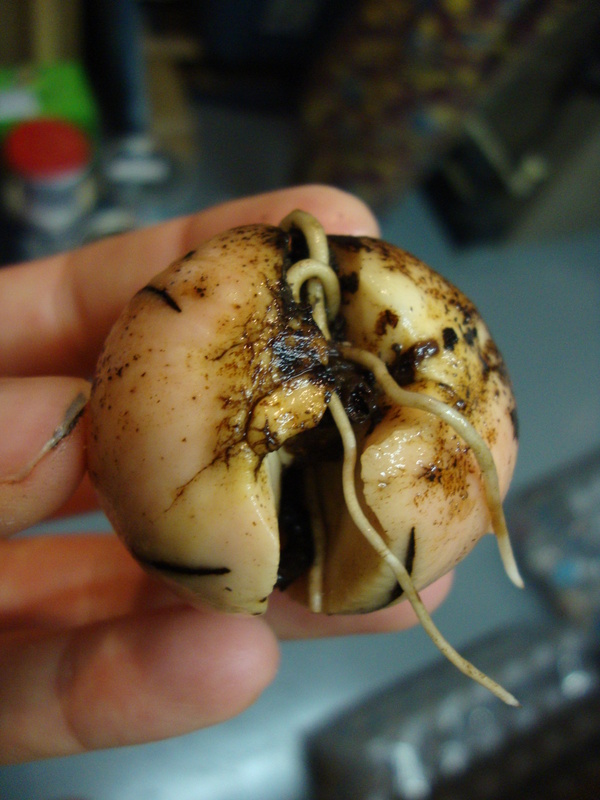 the roots have already split through the middle and it was ready to plant directly into soil. aww look at you two go! Gordon and I are planning on making/growing a patio garden this spring (something I’ve been wanting to do for a long time!) Good luck with all your eco-adventures–looks like fun.